HG's Super Bowl Survival Guide! Super Bowl Sunday is about more than watching one team square off against another -- it's about friends, fun, and food! Read on for some tips on how to enjoy the big game day without consuming big calories. Whether you're throwing the party or just attending it, we've got you covered. Stock up on smart snacks 'n swaps. Hosts: Don't want to pull a party foul by supplying only slimmed-down eats? Go 50-50 -- set out some guilt-free snacks as well as some of the traditional treats. Partygoers: Be an MVP among calorie-conscious pals by contributing to the snack table with an item or two. Click here for crunchy snack picks and here for game-day-worthy food finds. And check out the recipe roundup below! Mealtime? Load up on filling (but not fattening) stuff. Chili can be a good option, but if it looks greasy, it's probably packing some serious fat. Skip the cheese, sour cream, and other fatty toppings; pair it with some carrot sticks from the buffalo-wing platter. If there's a sub platter or deli plate, GREAT. Go for lean meat like turkey, skip the cheese and the mayo, and add some flavor with mustard. Don't forget a pickle spear! Go easy on the beer. For many people, beer and football go together like Egg Beaters and Laughing Cow. But with all the things to chew, you probably won't want to waste too many calories on beverages. If you're gonna have a beer, choose a light one -- most bottles have around 110 calories each. Some ultra-light beers have as few as 55 calories a bottle! Drink water. Don't get stuck drinking nothing but beer and soda. Making a point of drinking water will keep you hydrated (duh) and help you to avoid too much idle snacking. Sometimes we eat because we're actually thirsty -- don't fall into that trap. Have fun! It IS a party. So while it's a good idea to be smart, plan ahead, and eat consciously, you should absolutely not let that stuff get in the way of having a blast with your buddies. In fact, the more you get wrapped up in the game and socializing, the less you'll focus on the food. Party smarty! 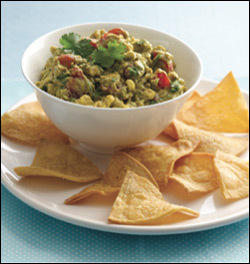 Rockin' Roasted Corn Guac 'n Chips - Fat-slashed guacamole and easy oven-baked chips?! Yes! Pizza-Pied Nachos - Pizza and nachos are both game-day favorites. Why not combine the two? This recipe ROCKS. Big Blue Buffalo Jala' Poppers, Bacon-Wrapped Pepper Poppers, and Mexi-Crab Stuffed Poppers - Three amazing jalapeño popper recipes to choose from. Wait... why should you have to choose just one? No-Buns-About-It Chili Dog Chili - Another winning combo of two beloved party foods. This hot-dog-happy chili will have your pals cheering as they chew! Turkey-rific Taco Bean Dip, Fruity & Tangy Cocktail Meatballs, and Berry Sweet-Tart Slow-Cookin' Cobbler - Two snack-tastic recipes just right for football fans, plus a fun 'n fruity dessert... all made in a slow cooker (just not at the same time). Mostly Roasted Veggie Explosion - This party platter blows basic crudités right out of the water. Might we suggest pairing it with our Sweet Caramelized Onion Dip? Exploding Chicken Taquitos - Another EXPLOSION of deliciousness! Go long! Click "Send to a Friend" to pass this email across the field... er, Internet. Wanna safely celebrate National Carrot Cake Day (which is today, February 3rd)? Try our 14-Carat Cupcakes recipe -- SO GOOD.